My name is Rosaria Losito and I would be happy to welcome you to Peschici for an unforgettable holiday where the crystal clear azure sea is only a short distance either on foot or by car. I am the proud owner of Rose Villa Bed and Breakfast which is situated in a leafy residential area only a short walk from the town centre. This ideal location offers visitors a comfortable haven from the heat of the summer sun away from the rest of foreign tourists who come to see the town. As I have said, Peschici not only offers the beach but also cultural highlights with its nearby old town and castle which hosts various artistic events. The medieval church is always open to believers and visiting tourists and there is a modern art gallery in the tower close to the town gate. According to the myth of Diomedes, who found himself in Gargano after the Trojan war, Peschici is home to one of only three sculptures of the Greek hero in the world. Made in bronze it is modern and situated on the Ialillo Lido. If you fancy discovering more of the surroundings, it is worth visiting the medieval towns and museums of Vieste, Vico and Monte Sant'Angelo. Popular excursions by boat include the Tremiti Islands and the Sea Grottoes and just a few kilometres from the coast lies the Forest of Umbra with its many trails suitable for trekking either by foot or by mountain bike. 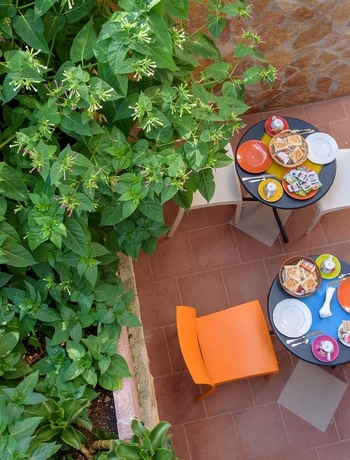 Continental breakfast is served in a relaxed setting on a garden patio with delicious local cakes, pastries and coffee or you can choose local Gargano bread and tomatoes with our very own high quality olive oil. ROSARIA can help you out with any problem, accompany you on visits upon request and provide information or translations in your own language. In her you will find a cordial and friendly service. Have a happy holiday!